New York is not a fashion week city traditionally known for its sets and productions. Aside from Marc Jacobs — who became known for his elaborate collection tableau before he stripped everything away except the audience’s folding chairs — the focus is typically on the product, not the performance. However, this season Raf Simons at Calvin Klein and Kerby Jean-Raymond of Pyer Moss changed all that. Simons trucked in 50,000 gallons of popcorn from Chicago and filled the floor of the old American Stock Exchange building with the stuff, which piled up in drifts along the sides of four rickety barns, crunched under guests’s feet, and stuck to models’ shoes and prairie-dress-meets-hazmat-suits they wore down the runway. The effect was like a B-movie nuclear winter in a dream western town. Fashion month is an endurance test: The days are nonstop, with dozens of shows and several appointments in between. The grueling schedule often neglects time for basic necessities like food. So it was a welcome treat to showgoers that several designers revolved their shows around food this season. 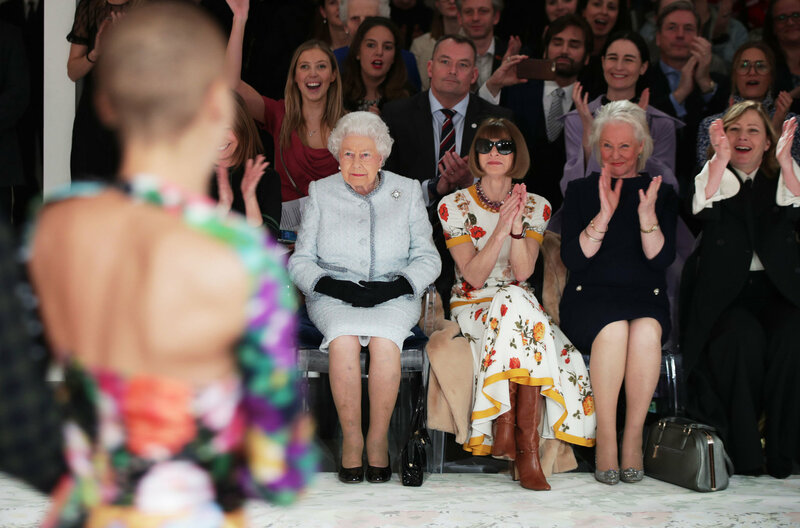 After 17 years as the creative head of Britain’s biggest and best-known luxury brand, Christopher Bailey waved farewell to Burberry on the Saturday of London Fashion Week with a big, bold technicolor show, opening with Adwoa Aboah in rainbow stripes on a white silk skirt and closing with Cara Delevingne in a giant rainbow faux-fur coat. When the standing ovation came, however, the applause was for the man himself. After a small bow to all four flanks of the vast room, and a kiss for his husband Simon, Bailey smiled, took a last turn on the Burberry runway, then walked out of sight. — E.P. Accessories always play a major role in Milan Fashion Week — there are almost as many shoe and bag presentations as catwalk shows, from Guiseppe Zanotti’s rock-inspired stilettos and sneakers to Jimmy Choo’s pearls and platforms — but this season two catwalk shows took the whole thing to a different dimension. First, Alessandro Michele created a series of model cephalophores — models carrying replicas of their own heads instead of, say, tote bags — for his Gucci show, an image that launched a thousand memes. Then he mixed in some “dragon puppies,” which turned out to be little rubber baby dragons, for good measure. He even added a third eye in the middle of one model’s forehead, because — well, who knows what goes on in that head? Meanwhile, Tod’s, apparently inspired by the dragon puppies, or just cosmic coincidence, opted for real puppies, from cocker spaniels to bulldogs, cuddled by Gigi Hadid and company as they pranced down the runway. It gave new meaning to the term “Instagram moment.” But this might be one look you don’t want to replicate at home. — V.F. The foreign press arrived in Milan a day before the official start of fashion week to view the unveiling of the new era of Moncler. The Italian-based brand, best know for its outerwear, has launched a new strategy: It hired eight designers to reinterpret the brand’s ethos — and its iconic down jacket. Valentino’s Pierpaolo Piccioli gave the brand’s signature piece a sculptural treatment, with hooded garments magnificently tall and exaggerated, while Simone Rocha, inspired by Victorian alpine hikers, remade the down jacket with romantic details like ruffles, pearls and micro-florals. The London-based designer Craig Green created samurai-padded protective suits and jackets, while the Japanese designer Kei Ninomiya, of the line Noir Kei Ninomiya, worked with an all-black palette adding woven details. Their designs, along with four from other houses, are a part of Moncler’s so-called “Genius” Project — and will be in stores as soon as next month, and run throughout the year. — M.J.G. When Humberto Lim and Carol Leon commit, they commit hard. For their third “La Collection Memento” for Kenzo — a kind of capsule collection — they took as their inspiration the post-Impressionist painter Henri Rousseau. Fair enough. Kenzo Takada, the house’s namesake Kenzo, is a fan. So Rousseau’s paintings showed up on sweaters, and his forest colors gave a backbone to their collection. So far, so good. For their presentation, they plied editors with groaning boards of fruits and vegetables (pineapple, pomegranate, radicchio with citrus), the kind of lush tableau Monsieur Rousseau might have appreciated. Slow and steady is not fashion’s preferred speed. But Kei Ninomiya, who began as a pattern-maker for Comme des Garçons and was eventually granted his own line, Noir, under its umbrella, began just that way. For seasons, he has shown quietly, at unglamorous, early-morning presentations at Comme des Garçons’ showroom, to a handful of enraptured editors and retailers who knew enough to seek him off the grid. His elaborate, exquisitely worked pieces were worth it: They seemed to burst into bloom. This season, Ninomiya got a full-size show of his own — and it was well worth the wait. He has the singularity of focus and finish to earn his place in the Comme des Garçons universe, but an organic, feminine sensibility that is all his own. All black, of course. And pretty tough. It may have been the week’s most promising (not quite) debut. — M.S. Sarah Burton came straight from her Alexander McQueen show; Haider Ackermann flew back after dressing Timothee Chalamet for the Oscars;Olivier Rousteing of Balmain hobnobbed with Pierpaolo Piccioli of Valentino. Natacha Ramsay-Levi of Chloé introduced herself to Clare Waight Keller, formerly of Chloé, now of Givenchy. Alber Elbaz huddled with Vivenne Westwood. And Stella McCartney FaceTimed her father, Sir Paul, so he could chat with the President. It was the first time the doors of the presidential palace had been open to the industry at large since François Mitterrand was in office in the 1980s, and it worked like a — well, charm. — V.F. An earlier version of this article misstated Burberry’s plans to fill the chief creative officer position vacated by Christopher Bailey. The brand announced that its new chief creative officer will be Riccardo Tisci; it is not the case that Burberry had not yet announced a replacement for Mr. Bailey.